Happy Monday friends! 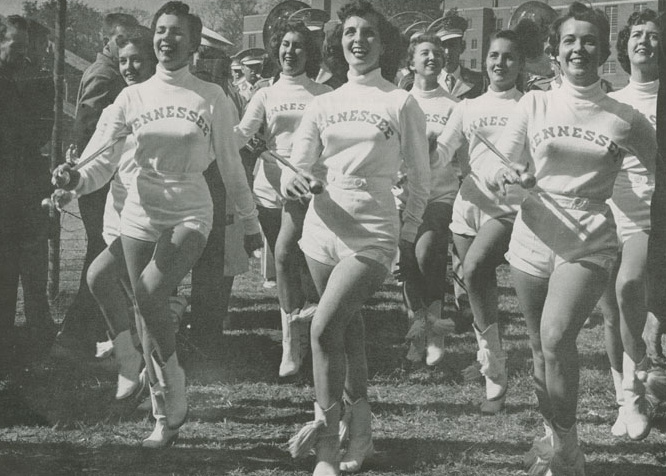 Here's a little something to make you feel encouraged...a whole squad of Grade-A 1950s University of Tennessee majorettes. They've got plenty of pep in their step...think it will rub off on you? Sometimes I forget how hard Mondays can be for folks. Especially when you have to wake up and go to a job you hate. Or maybe one that makes you feel less than appreciated. Or maybe you don't have a job to go to, but you need one. I've been in all those circumstances. And none are any fun. When I was working at my last job (you know the one), I used to get a stomach ache every Sunday night...dreading the coming Monday. That is a terrible feeling. My office was up a long, long flight of stairs with no elevator access. I used to daydream about how I might be able to get out of going to work if I broke my leg. This sounds crazy to me now, but it's true. Now that I've started my own business and am truly loving what I do, I get excited about each coming week in a way that I never did before. I met someone recently who said she thought I was brave for pursuing my dreams in this way. I certainly haven't felt brave at times. I mean, it took my getting fired to even get to this place. I don't know what your situation is. Maybe I've never met you. But I would stake my life on the fact that you were created with an amazing purpose in this life. I hope you can take a step in the direction of that purpose today....even if it's just inching one toe forward. Aren't happy with the direction your life is headed? It's never too late to turn things around. I truly believe that. That's my little pep talk for the day. Rah, rah...sis boom bah.